A cat killer who drowned two of her three pet cats in a toilet has been barred from keeping animals for life and narrowly been spared from jail. Chesterfield magistrates’ court heard on October 29 how Abbi Mann, 36, of Romford Way, Chesterfield, was found guilty after a previous trial of causing unnecessary suffering to two domestic cats, called Max and Bob, by killing them in an inhumane manner. Pictured is one of two deceased cats which were drowned by Abbi Mann, 36, of Romford Way, Chesterfield, who was found guilty of causing unnecessary suffering to the pets. 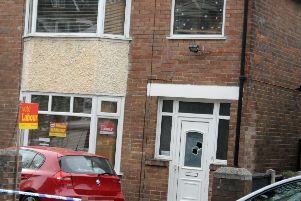 A police officer attended Mann’s home, according to Mr Cash, and ambulance staff were present after responding to a report of a person with suicidal thoughts and the defendant seemed under the influence of alcohol. Mr Cash added that a neighbour feared Mann had poisoned the cats and the matter was reported to the RSPCA and one of their officers visited and Mann’s third cat, Pebbles, was taken away. The defendant had also called the emergency services and told them one of her cats was struggling to breath and that she had pushed it down into the water and she had probably killed one of them. One of the cats also had a bruise, according to Mr Cash, consistent with being held around the back of the head in a form of restraint. During an interview, Mann said she owned the cats but could not say why they had been found wet and she claimed they had been poisoned by neighbours who had been bullying her. Mann denied causing unnecessary suffering to the two cats by killing them after the incident in July, 2017, but she was later found guilty at a trial. The court heard she had also committed the offence while she was subject to a suspended prison sentence imposed for a motoring offence. Defence solicitor Shirley Fitton said her client has suffered with depression, mental health and alcohol issues and she had been as upset as everybody else because she dearly loved the cats. Mann was sentenced to 26 weeks in prison suspended for 12 months with a Rehabilitation Activity Requirement. She was also disqualified from keeping animals for life but she can apply to have the ban lifted after eight years. Mann must also pay £1,250 costs and a £115 victim surcharge. District Judge Davison formally placed Pebbles into the care of the RSPCA.